thistlebear: Paintbox Yarns cushion + a giveaway! If you've been reading my blog for a while, you know that I am a serious fan of acrylic yarns. I use them for almost everything, but especially for items I crochet to use around the house. This includes blankets and decorative items. I find that the durability of acrylic yarns works really well for my household, allowing things to really get used in everyday life. I also like acrylic yarns for their affordability; my crafting budget is rather limited, but I love to crochet, so acrylic gives me the chance to make as many things as I want without spending a fortune. I love other fibers too, don't get me wrong, but I come back to acrylic yarns - particularly in worsted and double-knit weights - again and again for the kinds of projects I like to make. I was delighted recently to be offered the opportunity to try out Paintbox Yarns Simply DK, sold on the LoveCrochet site. 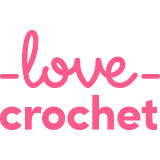 Are you familiar with LoveCrochet? You should be! LoveCrochet is a global hub for crocheters: a dedicated site where makers can find inspiration from our thousands of patterns, share projects and shop from the world's biggest stash of yarns. LoveCrochet's aim is to inspire everyone's inner maker, spread the joy of making and to make making a magical experience. 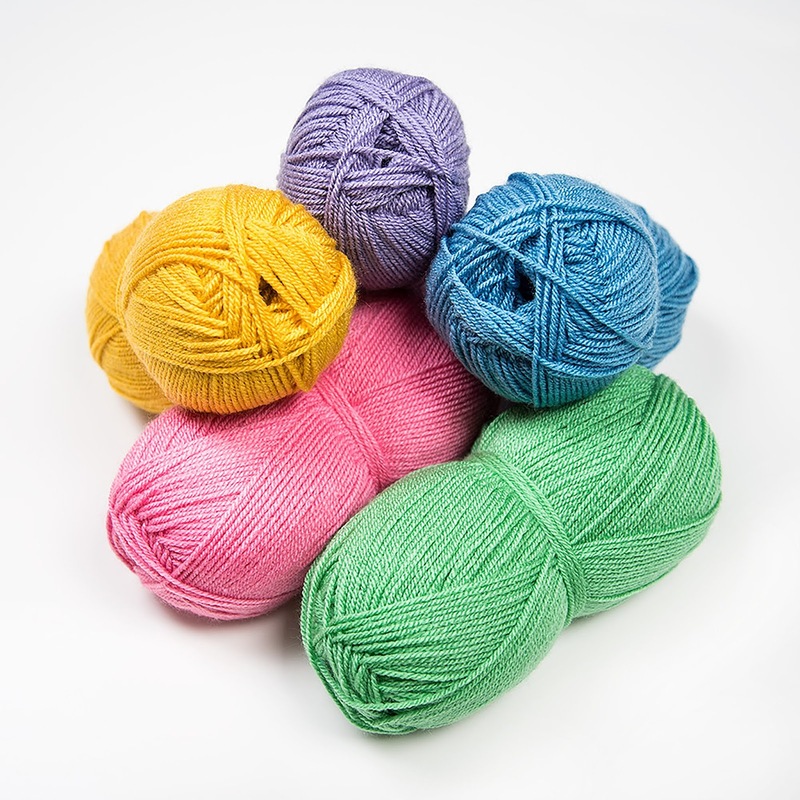 Through their site, crocheters can connect with one another in forums, share their creations, download patterns and purchase yarns like those in the Paintbox line, along with brands like Debbie Bliss and MillaMia. They offer lots of free patterns and they regularly post tutorials and how to guides. When you shop with LoveCrochet, you'll get free delivery on all orders over $60 and 20% off orders over $100 with free returns on everything! For knitters, they have a sister website called LoveKnitting and an app for all your knitting needs. Knitters and crocheters alike will find lots of great resources and supplies on their sites. Paintbox Yarns Simply DK comes in 60 beautiful and vibrant shades. LoveCrochet asked me to choose a pattern from their library to use with my yarns. 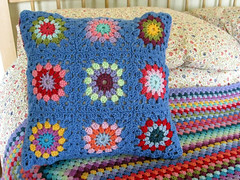 I decided on the Daisy Cushion, a pretty granny-flower pattern designed to be made with Paintbox Simply DK. I opted to use Misty Grey for the main color, along with Blush Pink, Slate Green and Mustard Yellow for the flowers (I provided my own cushion insert and buttons to complete the project). My yarn arrived in a lovely organza drawstring bag. I got started as soon as possible and found that this yarn is very nice to work with - really soft and light, with very little splitting. 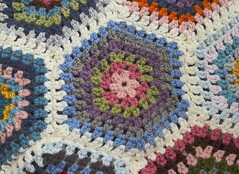 The front of the cushion calls for 25 flower squares. I made 13 pink and 12 green, all with yellow centers. I enjoyed making these little squares! The technique was new to me, and I thought the flowers looked very pretty with their pointy little petals. I did find the pattern just slightly confusing at times, however. It's written in both UK and US terms, which is good, but it took me a little getting used to. I always find myself getting confused between doubles and trebles! Some of the other language in the pattern took a bit of getting used to as well, but I think this may be a difference between UK English and US; nothing major, just slight wording differences, I guess you could say. Once I'd made all 25 squares, I crocheted them together in strips of five squares with the colors alternated (the pattern suggests sewing the squares together, but I much prefer to crochet squares, so I did that instead). Then I crocheted the strips together to create a solid piece and got started on the cushion's back, which is just a big granny square, all in gray, with rounds joined in the corners (I was so glad to see they used this technique in the pattern, as it's my new favorite way to make a big square and it worked great here too). I also liked the construction aspect of the cushion, as in putting front and back together and adding closure. The cushion front and back are joined on three sides by a round of single crochet, leaving the fourth side open. Then the fourth side is worked almost in the round, by adding a button strip along the front and a solid edge on the back. The button strip is really simple but effective, made with four chain loops evenly spaced along the top edge. The buttons (I used simple varnished wooden ones) are sewn onto the back top edge and they're easily fastened into the button loops. Simple. My finished cushion! I'm really happy with it. I think the colors work well together and look nice in my living room. The cushion cover turned out just slightly large for my 18x18 pillow insert, which isn't ideal, but it's close enough and I don't think the size difference is very noticeable. I can only assume this happened because my crochet tension was a little loose. I don't mind, though. I think it's lovely just like this. I love the back as well. It's just a simple granny square, basic and effective. You really can't go wrong with a simple cushion backing. I like it so much I would display it this way sometimes as well. And I like the way my Daisy Cushion looks with the other pillows on the couch. It looks right at home! I'm really glad I chose this project and I absolutely loved working with Paintbox Yarns Simply DK. Thanks, LoveCrochet, for the opportunity to try it out and make something pretty for my home. Would you like to try some of this yarn too? Scroll down for an exciting surprise! LoveCrochet has generously offered to send one lucky reader TEN balls of Paintbox Yarns Simply DK in the colors of their choice! Aren't you so excited!? I know I am. I loved working with this yarn and I can't wait for you to try it for yourself. Then you could make this cushion cover too (twice!) and we can be cushion twins! Or make something else of your choice. No matter what you make, it will be gorgeous with all those colors to choose from. Here's how the giveaway works...please read the following carefully. To win my giveaway, you must leave a comment on this post (one entry per person). Your comment must include your intention to be entered in the giveaway (just say you wish to be entered). You also need to go to the Paintbox Yarns Simply DK product page, have a look around, and tell me at least one color that you really love from the product line in the SAME COMMENT. You can list as many as you want, of course! I will draw the giveaway winner from the comments in two weeks, on October 12. I will then contact the winner via email (and subsequently announce the winner on my blog). The winner's email address will be forwarded to a LoveCrochet/LoveKnitting representative who will work with you to choose and send your ten balls of yarn. Your prize choice may depend on available stock. This giveaway is open to readers in the US, UK and AUS/NZ. Okay, go! 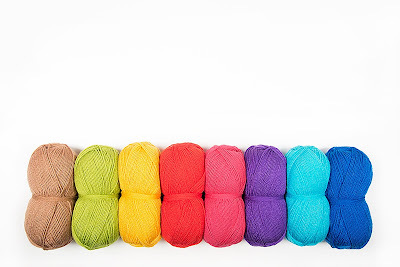 Get that lovely Paintbox Yarns Simply DK for yourself! oh how fun! what a nice set of colours they have to offer! I liked the serville orange, banana cream, spearmint, and the kingfisher blue! oh and the cushion you made is so lovely and those wooden buttons are charming! I like acrylic yarn too - very durable and (unfortunately for me) lots of more natural yarns that have wool in them are itchy to my skin so acrylic is the way to go for me! oh, I guess I forgot an email, opps! my blog email is roosjeblog AT yahoo DOT CA (not dot com)! Hi Jennifer! My favorite colors were pansy purple and dusty lilac. Actually, I liked all of the shades of purple! I would love to be entered in the giveaway. I think you have my email but just in case you don’t it is queenbetsy2@gmail.com. Your cushion turned out beautifully. I love the colors that you chose. The soft gray sets the flower colors off perfectly and I like the way you did the button closure. I think I will try that on my next pillow. It does look right at home on your couch! I hope you have a lovely day my friend. Some beautiful shades but the reds spoke to me, tomato red, pillar red. I would like to be included in the draw for the giveaway. My e-mail is mamab1@live.com. Loved your cushion, the wooden buttons were a great finish. I love your cushion, I am a knitter not a crocheter and am totally awed by all your crochet items. My grandson lives bright colours (and his mum loves easy care acrylic). He would love a jumper in Rose Red with a helicopter, train and tractor on it in other colours as they are his current obsessions. He's nearly 2. My email is dawnbeck42ATgmailDOTcom and I'd love to be entered into the draw please. Hi Jennifer - I've been following your blog for ages now and am very excited about the LoveCrochet offer. I'd love to be entered in the Paintbox DK giveaway please. The color range is amazing and I particularly like the Bright Peach and Dusty Lilac. Your pillow turned out lovely - good idea having the button closure as it will make laundering easy. I've only made one pillow and did a C2C one which I joined all the way around. It was a cow to wash! I'll send you an email with mine, just in case I'm lucky enough to be the winner of this amazing give-away. Your cushion is gorgeous Jennifer. I love making crochet cushions however our dog just destroys them, its so annoying! I love paintbox yarn - slate green is the most soothing shade. I would like to be entered please in the giveaway! Thank you for your blog - it is one of my favorites to follow. It is a really nice giveaway. Your cushion is beautiful! It looks so lovely on your sofa. Please don't enter my name in the giveaway, as I'm not talented when it comes to crocheting. What a pretty cushion, it looks right at home on your sofa nestled in with your other cushions. I'd love to be entered into the giveaway, I didn't realise that Paintbox Yarns do so many colours in their range. I'm into my yellows at the moment and love that Mustard Yellow but they do a good range of blues too and I'm always tempted by pretty names like Melon Sorbet. Never heard of that site or that yarn, but it sounds a lot like Ravelry which is good for patterns and seeing what others make. Love your choice of colors. I'm not a fan DK weight to crochet, but like it for knitting. For crochet and acrylic I like WW. You're right it holds up well for household stuff. It can be a bit hard on your hands though if you work with it too long at a time...so I try to break it up a bit.